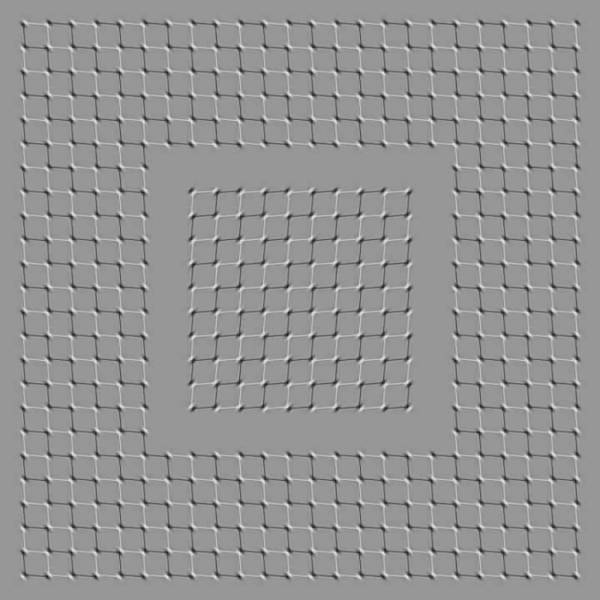 Move your head left and right. 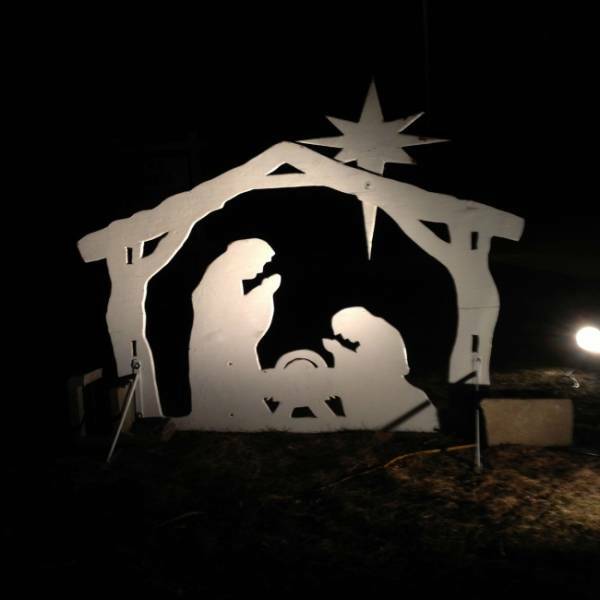 This Christmas decoration looks like 2 tyrannosaurs were fighting for a circular saw. 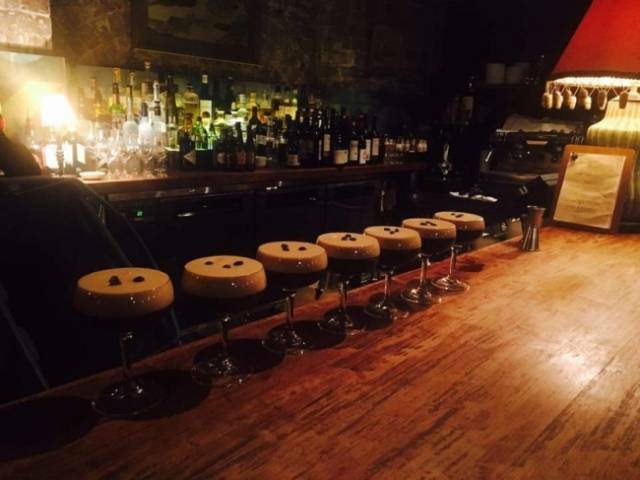 In fact, these are not bar chairs. These are cocktails. 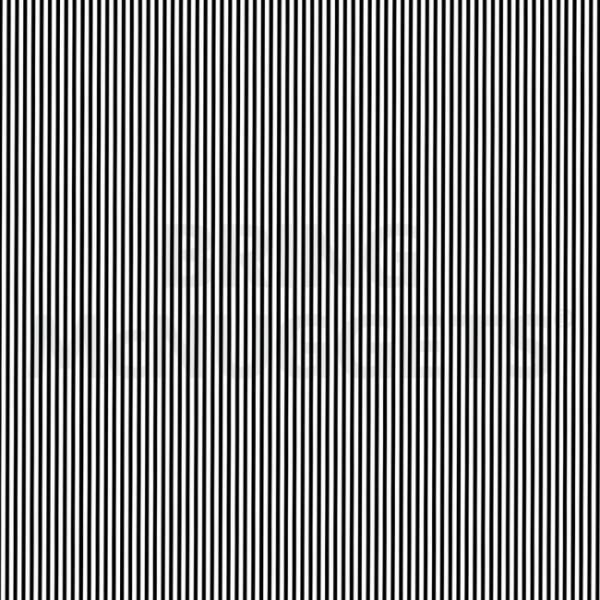 Shake your head or device left and right. 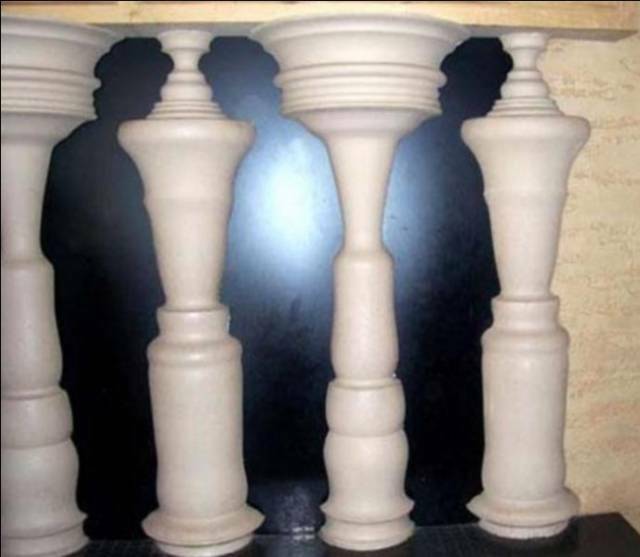 What did you see first: shadows of people or simple pillars? 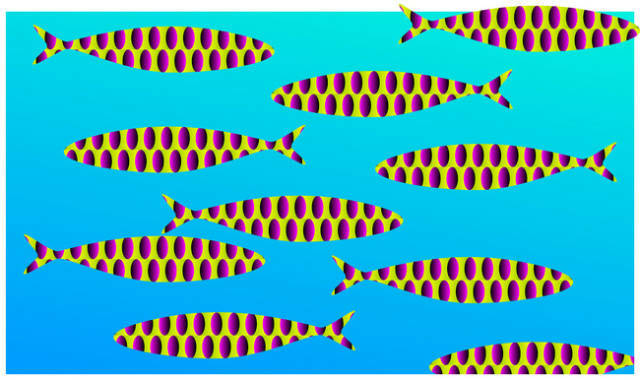 In fact, this is an image on a wall. 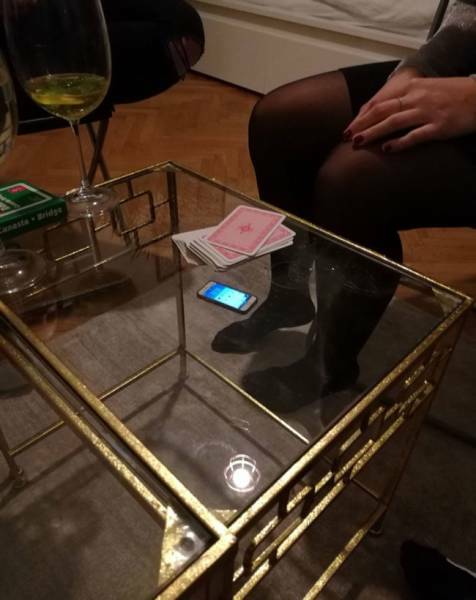 At first, I thought it was a mini phone and gigantic playing cards. 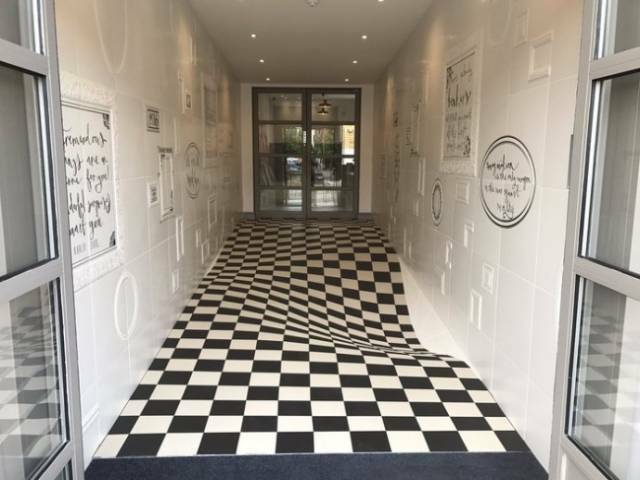 This is the floor of the lobby in an ordinary office. 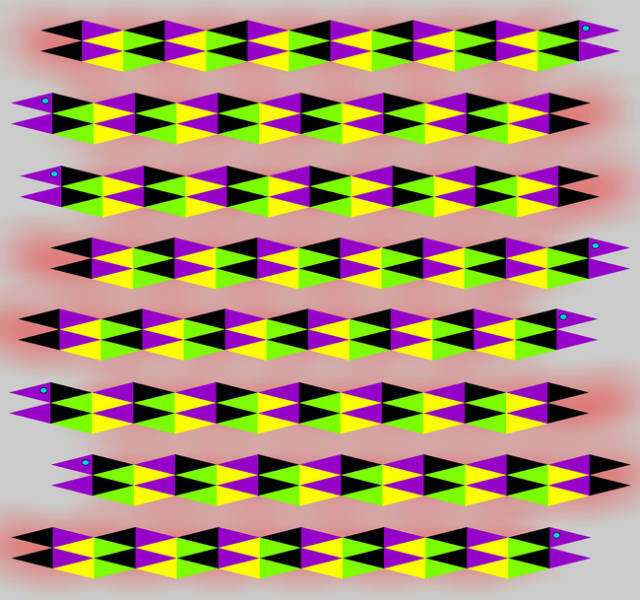 Turn the picture over. 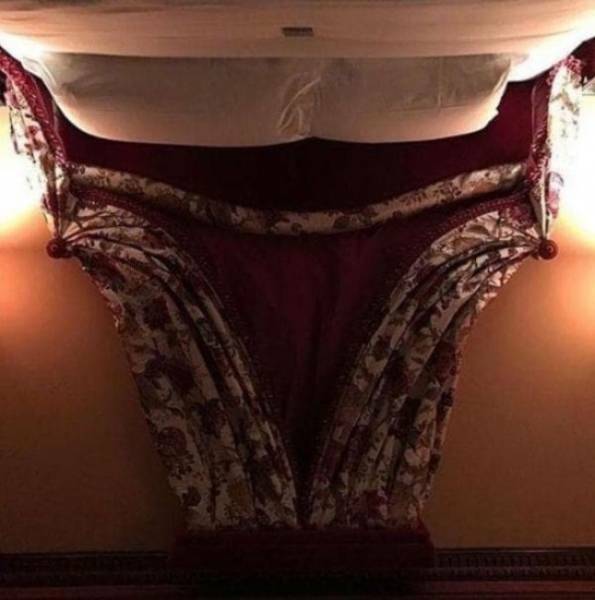 It’s a bed. And what did you think it was? 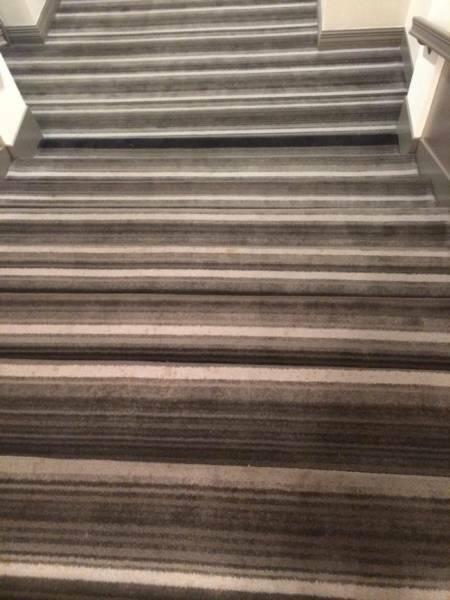 When I was covering the floor with carpet, I forgot about the staircase. 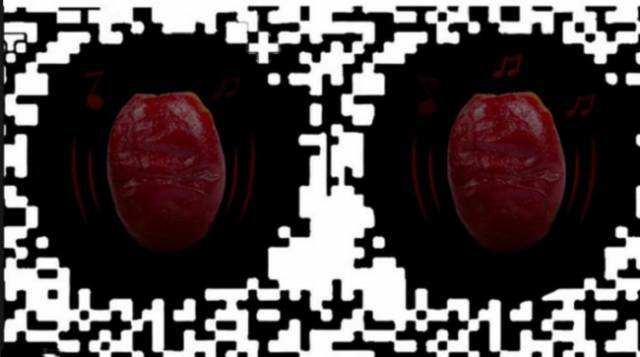 McDonald’s published this picture with a hidden message. 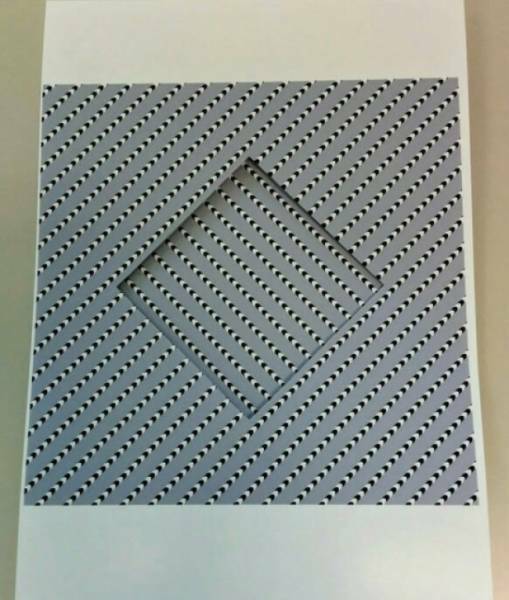 Try to unfocus your vision to read it. 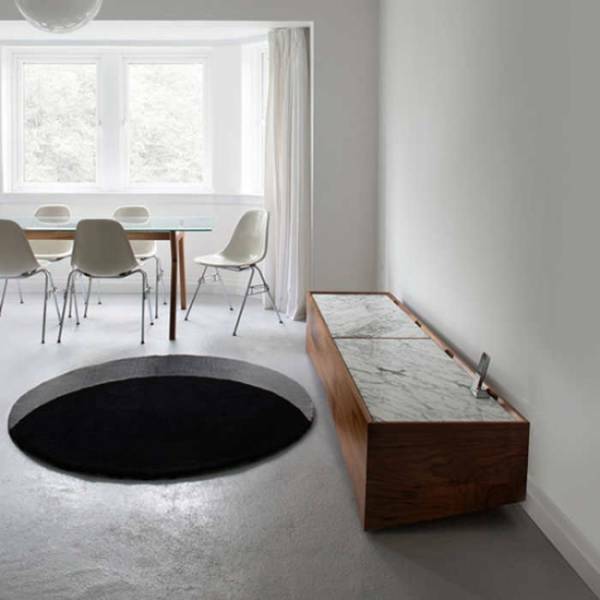 I bought a carpet and got a portal into another universe. 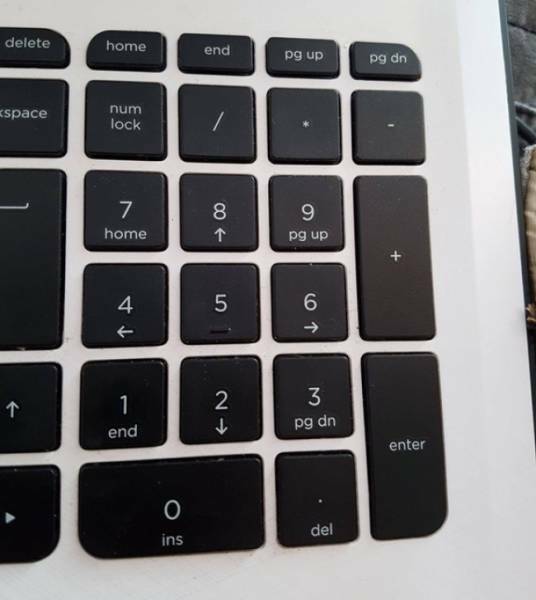 Do you also see the black dots between the keys? 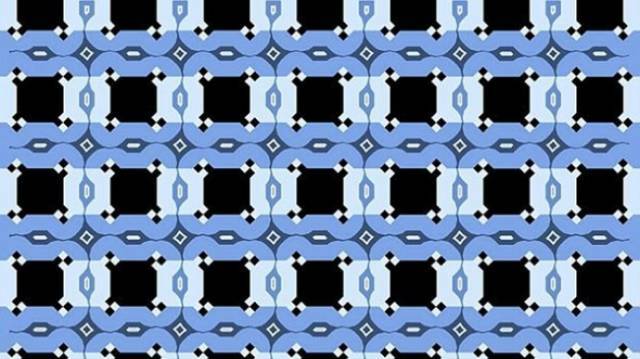 In fact, these blue lines are parallel to each other. 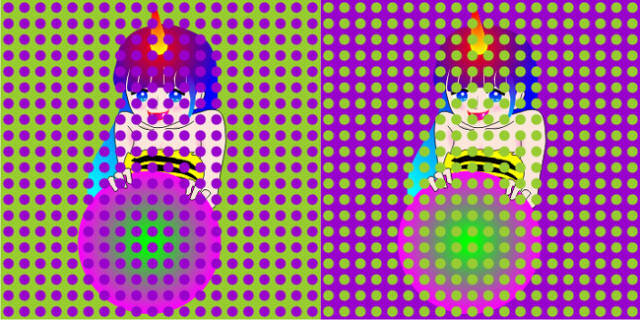 Look at the picture (preferably in complete darkness). 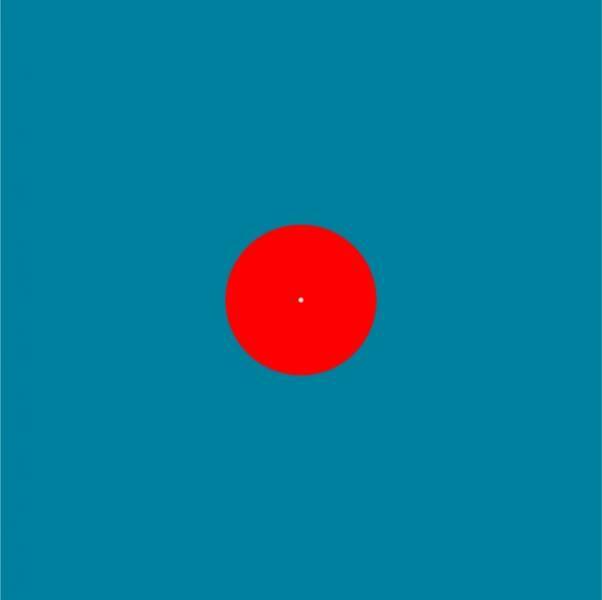 Focus your eyesight on the white dot in the middle. 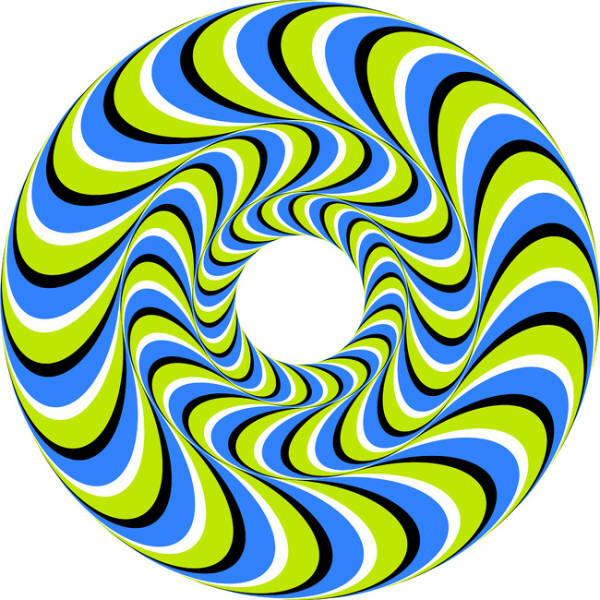 You’ll soon notice that the red circle is very red and that there is a ring around it. 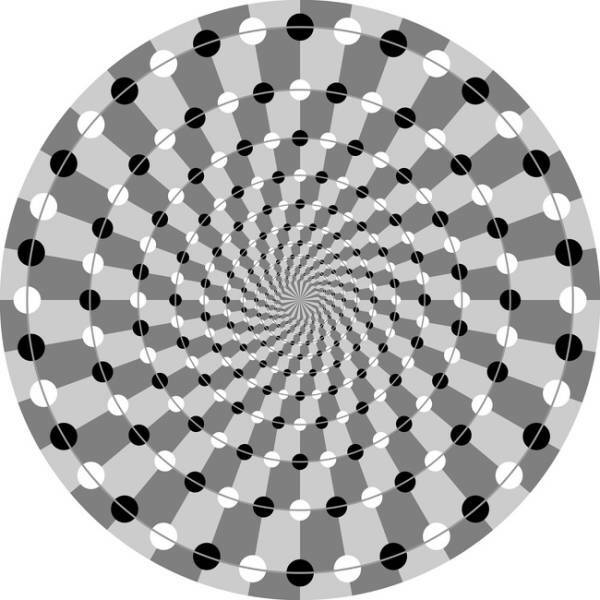 When this happens, look at the darkest point in your surroundings. Book worms will love this library and store in China. 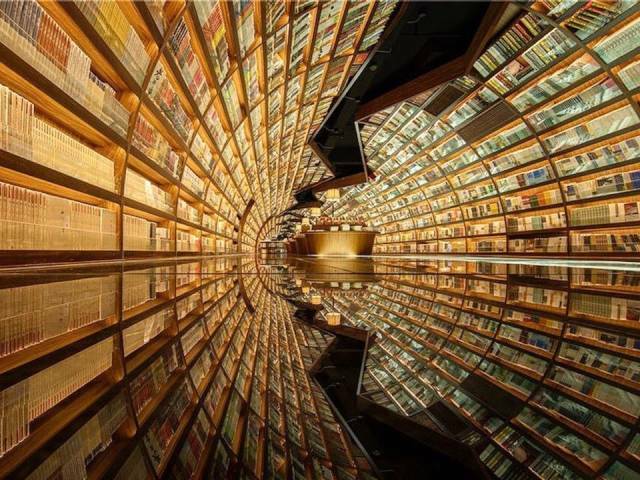 One of its rooms boasts black mirrored floors and curved shelves that reach up to the ceiling, creating the illusion that this "tunnel" of books stretches on indefinitely. 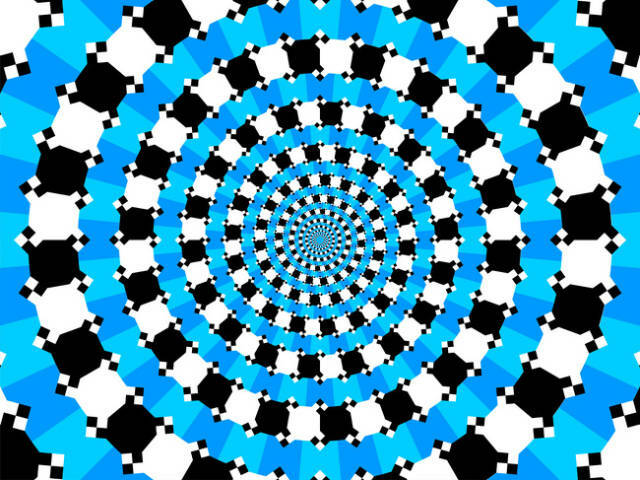 Pretty much every exhibit in this museum is dedicated to optical illusions. There's everything from the shrinking room (pictured above) to the mirrors maze and vortex tunnel. The shrinking room is commonly known as an Ames Room, named after American ophthamologist Adelbert Ames, Jr., who created the first such room in 1946. 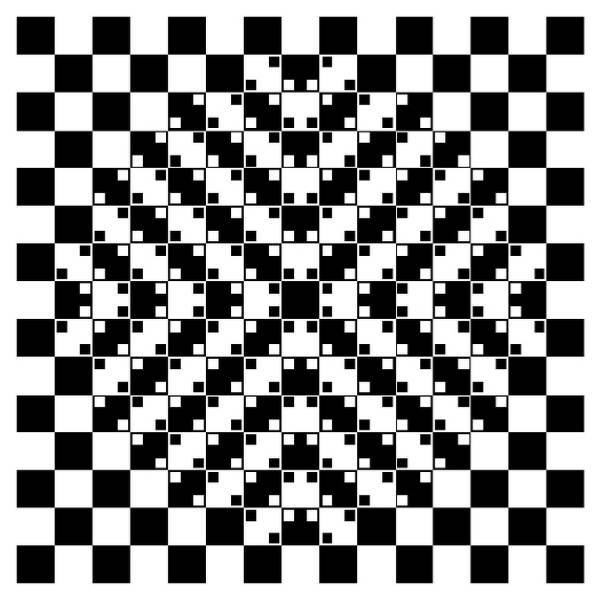 When seen from a certain viewpoint (through a pinhole), the room appears cubic, even though it's actually shaped like a trapezoid, meaning its walls slant outward and its floor is on an incline. 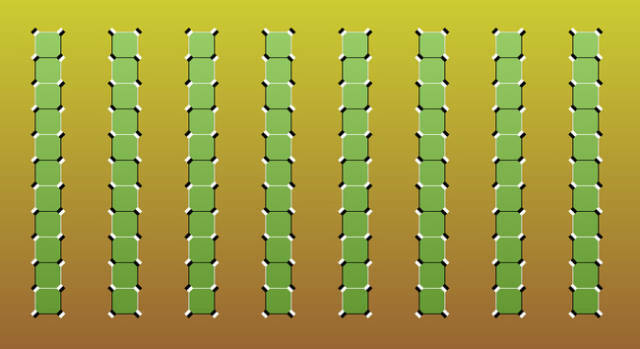 The room's far left corner is lower than the near right corner, which is why someone standing in one corner looks bigger than someone standing in another corner. This is also why someone in the room appears to be shrinking as they walk across the room. 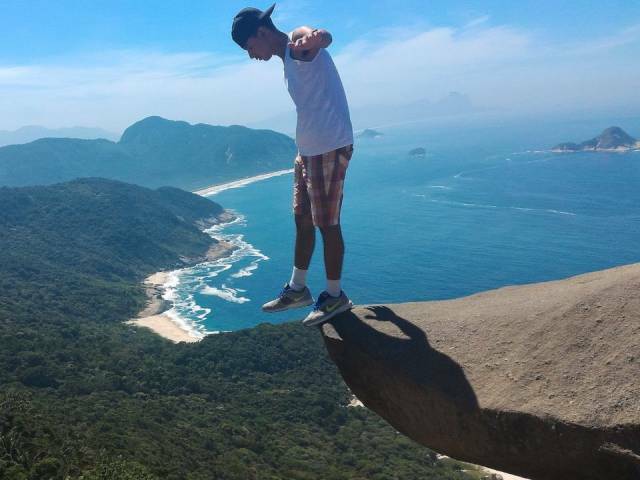 Tourists who take photos at Brazil's Pedra do Telégrafo look like they're risking their lives, but in reality, they're only standing a mere three feet or so off the ground. However, if you frame the photo just right, you'll be able to get the cliff and the ocean below, but not the ground underneath the cliff, creating the illusion that you're on the edge of a major drop. 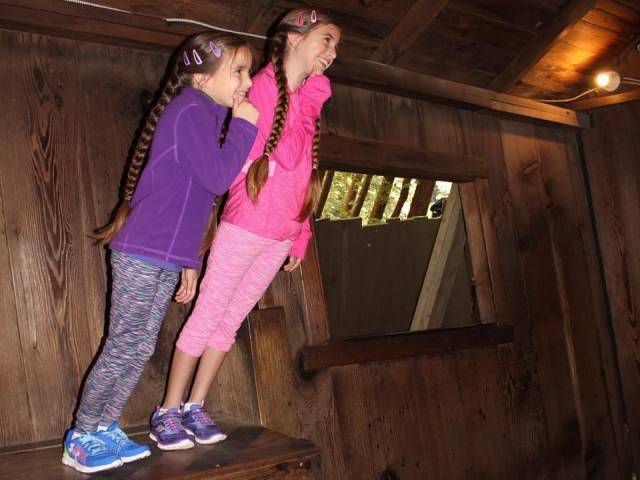 Described as a "gravitational anomoly," the Mystery Spot sits in California's Redwood Forest. The tourist spot challenges basic laws of gravity and physics; objects roll uphill and visitors lean over their toes without falling over. 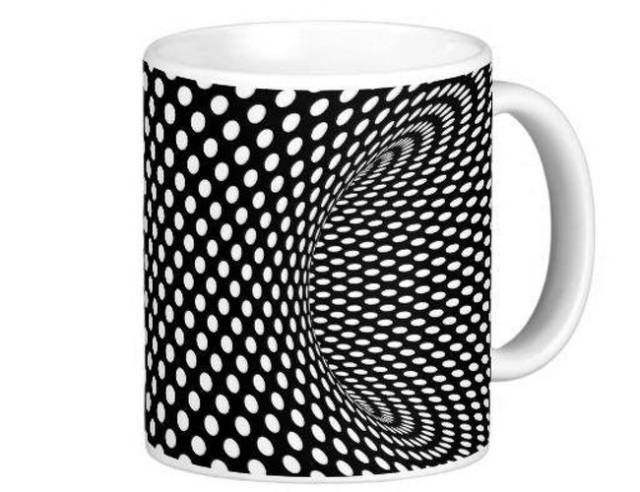 The explanation behind this illusion is two-fold. The Mystery Spot sits in a particular part of the Redwood Forest where the trees grow crooked, creating an environment that is titled. The spot's wooden house is also slanted. Visitors mistakenly use this house and the surrounding environment to judge movement — instead of the horizon — which is what causes their misperceptions. Amanohashidate means "bridge to heaven" in Japanese, but what's more interesting than this Kyoto landmark's name is the way in which visitors view it. 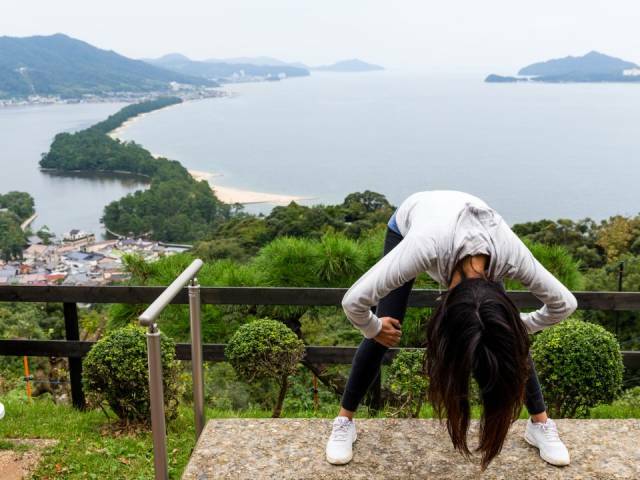 The sandbar, which stretches two miles into Miyazu Bay, is best looked at upside down, sticking your head through your legs. You'll see the bridge as a dragon flying into heaven if you look at it this way, and legend has it, doing so will bring you good luck. Located on San Francisco's Pier 39, this black-light-lit maze is quite the challenge, and probably one of the only places you'll ever be able to find yourself in two places at once. Mirrors don't absorb light, so when they're placed on a wall, they render that wall invisible. Because a mirror maze features mirrors on almost every wall, visitors have a hard time telling what is actually a wall and what isn't, causing them to bump into their own reflection. 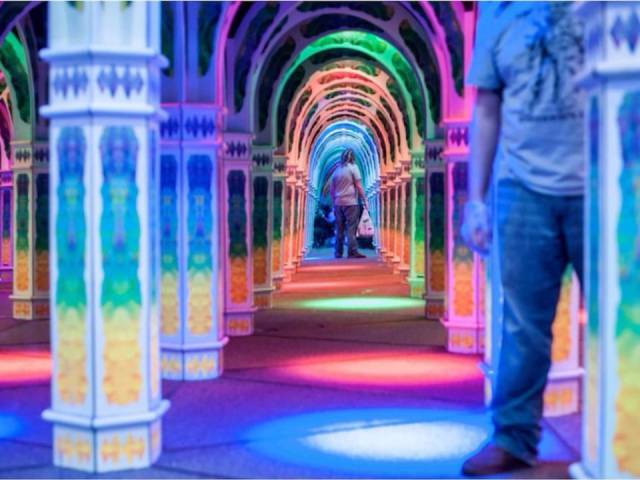 Visitors can spend hours trying to make it through the maze, bumping into their own reflections. 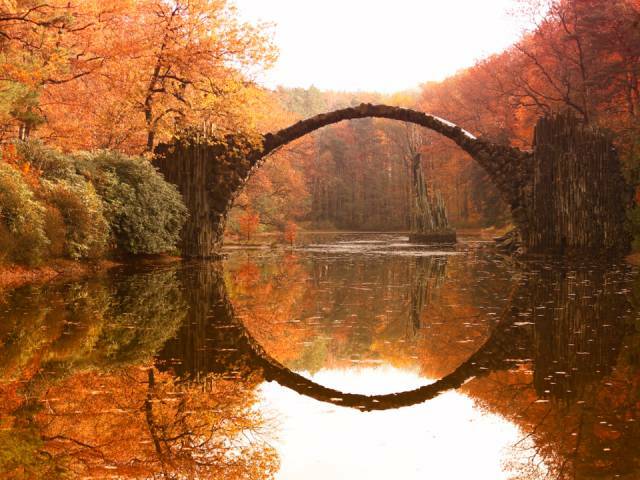 When viewed on a calm day, when the Rakotzsee below is still, it looks as if the bridge creates a perfect circle, thanks to its reflection in the water. The Hoober Stand was built in the mid 18th century to honor Thomas Watson Wentworth, who fought alongside King George II in the Jacobite Rebellion. Although it looks relatively plain from the outside, the stand is in the shape of a tapering pyramid with a hexagonal lantern on top. The tower's angles not only create the illusion that it's toppling over, but they also make it seem like the lantern moves depending on where it's viewed from. 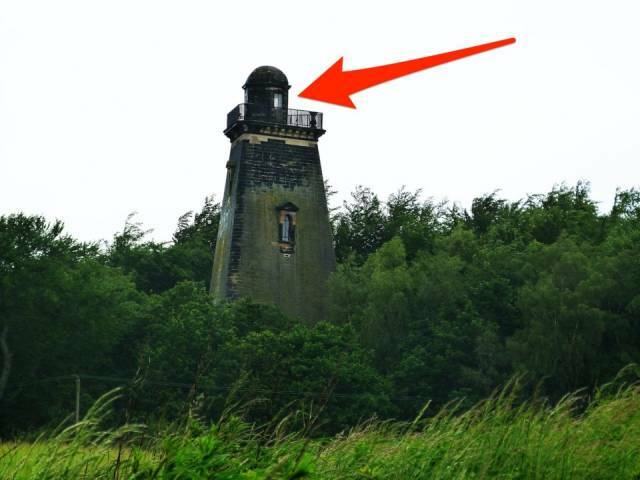 For example, in the photo above, the lantern looks like it's situated to the left of the tower's center, even though it sits squarely in the middle. This isn't your average museum where you simply look at the paintings on display. 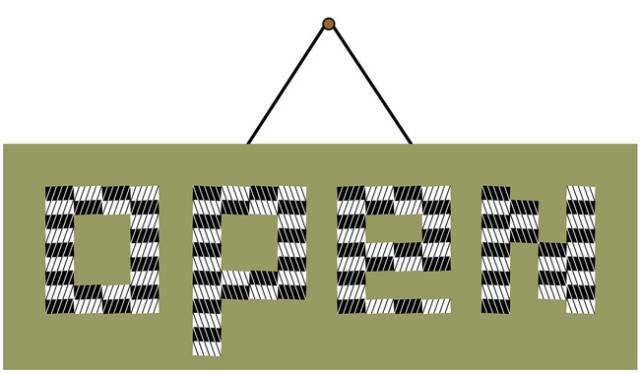 Visitors here interact with them. 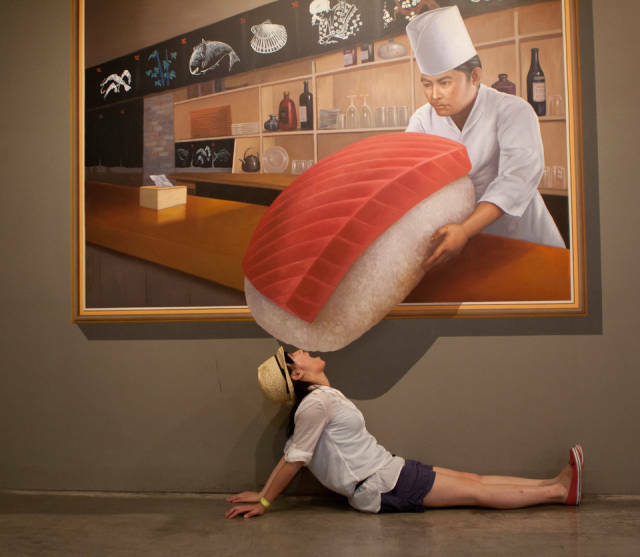 The artists whose work is featured in Seoul's Trickeye Museum use a technique known as "trompe l'oeil," which means "deceive the eye" in French. 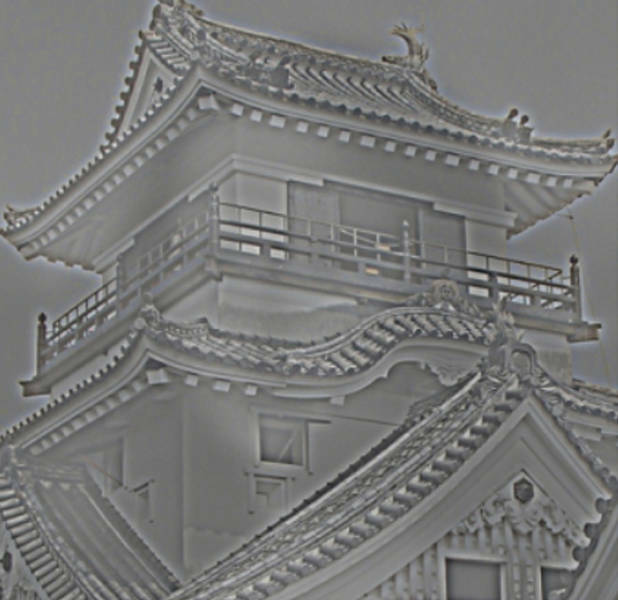 The technique uses perspective and specific shading techniques to create the illusion that 2D images are actually 3D, making them seem like they're popping out of the painting into real life. 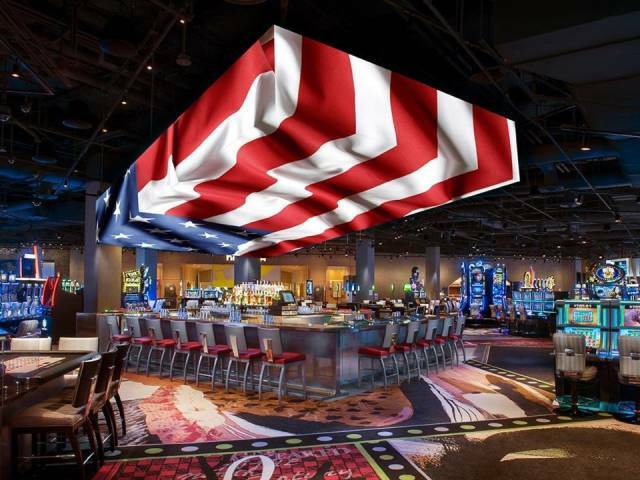 Most casinos are known for being over the top, but SLS takes it to the next level with the large LED screen that sits above its bar. The screen, which boasts more than two million LED lights, makes images come to life in a shockingly realistic way. Anything from a rubber duck to a giant face have looked down on bar visitors in the past. Pictures don't do the illusion justice though, watching it is much more impressive. 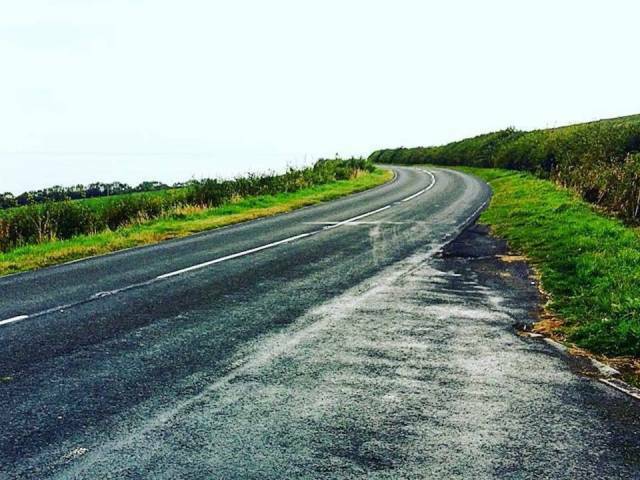 This gravity hill in Scotland is sure to stump anyone who looks at it. The road, located alongside a cliff, appears to be going uphill when it's really going downhill and vice versa. 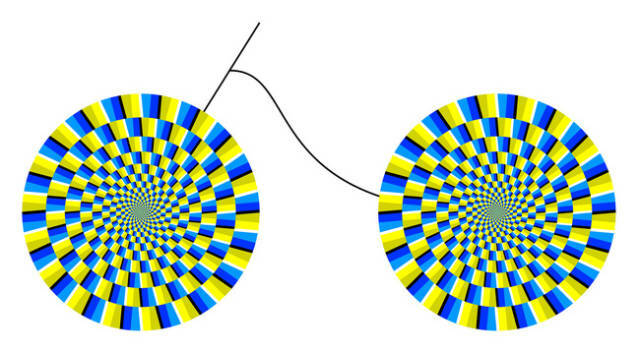 Therefore, a car without its brakes on will look as if it's rolling uphill, pulled by some unseen force. 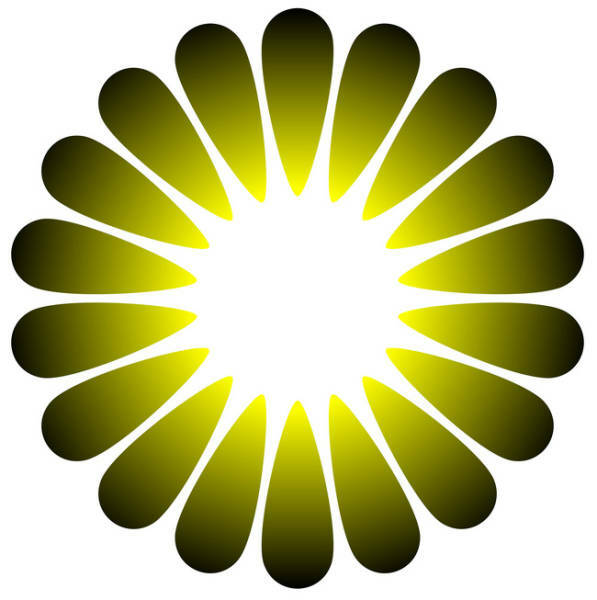 For years, people thought that this unseen force was electricity, hence the hill's name. 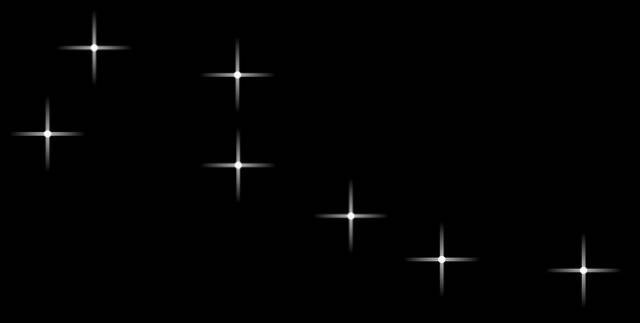 In reality though, gravity hills are optical illusions, created when the horizon is obstructed. 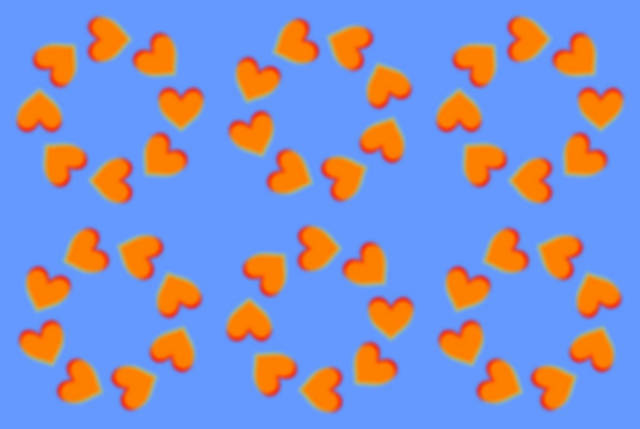 Without a horizon as a reference, it becomes hard for viewers to determine which way a hill is sloping. 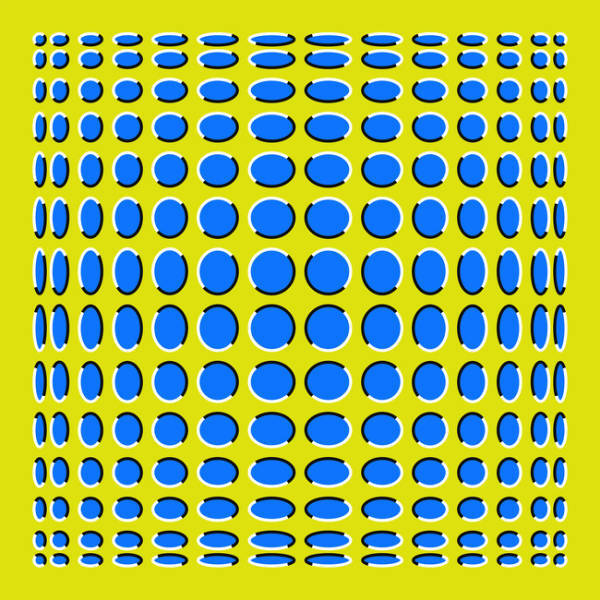 Now try to blink really quickly.